For my son's 14th birthday he asked for a Minecraft party. All of his friends were coming over with their laptops and tablets so they could sit around and play Minecraft. This meant I didn't have to come up with party games, so I had plenty of energy to come up with a Minecraft feast. I have to admit I was relieved my son asked for pumpkin pie instead of a cake. 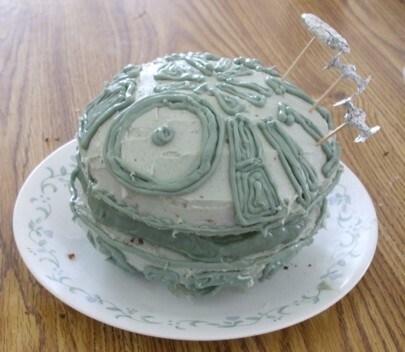 I could have tried to copy the exact look of a Minecraft cake, but it probably would have turned out like that Death Star cake my son's friend took for a sea slug at a previous birthday party. When it came time for dinner at the Minecraft party, the party guests really got a kick out of the food. At first some of the boys were reluctant to try the mushroom stew, but those who did try it convinced the others to give it a go, and after that it was gone pretty quick. Purchase the supplies you need, such as the two pounds of fresh mushrooms, eight golden delicious apples, eight carrots with greens attached, and a medium-sized watermelon. In a large bowl, put the 4 cups of water, 2 TBSP yeast, and 1/4 cup sugar. Let the yeast dissolve and begin to bubble. Add six cups of flour, the butter, and the salt. Stir until completely mixed. Add 2 more cups of flour to make a soft dough. Sprinkle a clean surface generously with flour. Turn out the dough and knead for ten minutes, adding more flour if the dough gets sticky. Return the dough to the bowl, cover with a damp cloth, and let rise for about one hour, until doubled. Punch down the dough. Divide it into eight equal pieces. Grease two large baking pans. Flatten each piece into a rectangle and roll up into an oval-shaped loaf, like the bread in the Minecraft game. Pinch the seams and the ends to seal. Place four loaves on each pan. Make three diagonal slashes in the top of each loaf. Cover with a damp cloth and let rise for about 30 minutes. Preheat the oven to 375 degrees Fahrenheit. When the oven has finished heating, put the pans in. Bake for 20 minutes, or until the tops of the loaves are golden brown. Remove pans from oven. Remove loaves from pans and let cool on racks. Store at room temperature in air-tight bags or containers until ready to serve. For the pumpkin pie, just use your favorite recipe or buy a pie from your grocery store bakery. Wash and slice the mushrooms. Melt the butter in a large skillet. Add the sliced mushrooms and cook until the mushrooms are tender, about 20 minutes. Add the chicken stock and thyme and let simmer, uncovered, for another 20 minutes. Add milk or cream and season with salt and pepper to taste. Serve warm. While the stew is simmering, prepare the fresh fruits and vegetables. My grocery store carries organic carrots with the greens still on. They taste fantastic, like fresh from the garden. Remove any badly wilted greens. Wash and peel the carrots without removing the tops. Wash the golden delicious apples and place them in a bowl. Wash the watermelon, then slice it longways into wedges.